Kenya’s 400m hurdles World Champion Nicholas Bett has been confirmed dead in a car crash. The 28-year-old was killed in his home country of Kenya near Nandi a day after returning from the Continental Championships in Nigeria. He took gold in the 2015 World Championships at the famous Bird’s Nest stadium – home of the Olympics in 2008. He is also a two-time African Championship Gold medalist, whose twin brother Haron Koech is also a 400 meters hurdler. His family and county police commander Patrick Wambani confirmed the tragic news. “Bett died on the spot after the car he was driving veered off the road and landed in a ditch, said Wambani. The commander added that the athlete hit a bump before losing control of his car. 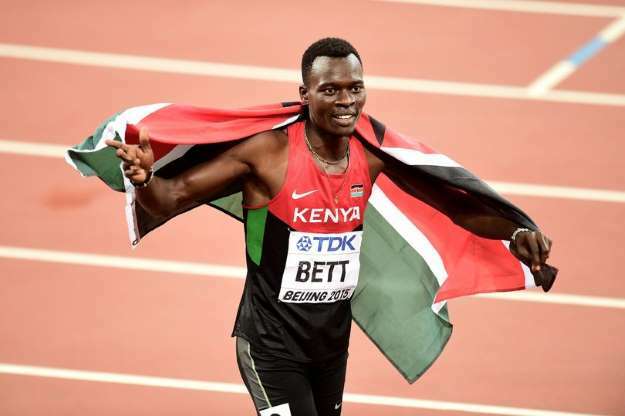 Bett’s finest moment was the magnificent run in the Bird’s Nest stadium back in 2015 where the he ran a personal best 47.79seconds to claim the gold. He did not qualify for the Olympic Games in Rio, but finished eighth in recent Commonwealth Games in Australia.